In the spirit of it being a me-day (ha! ), I’ve decided to answer the questions that Shaina from Shaina Reads posed to me in her blog this week. 1. What is the first book you can vividly remember reading? I don’t know if “reading” is the right term, but I very vividly remember Goodnight Moon from my childhood. I must have had the words memorized. Still, the memory is vivid, and so I’m counting it. 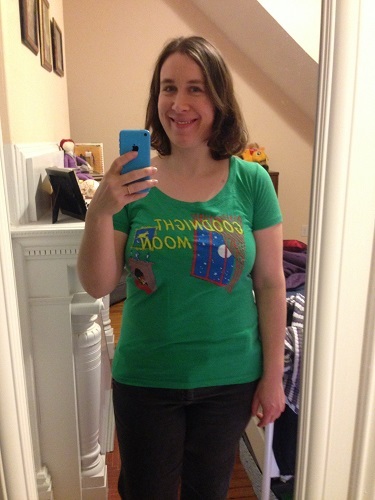 😀 Also, I bought myself that shirt –> as an early birthday gift. 2. If you only had time to read one more book in your life, would you want it to be an old favorite or a new one? Why? Definitely an old favorite. If I only had time to read one more book, then I assume I’d know I was dying. I would want as much comfort as possible in that time, and thus would choose to spend that time with an old friend, rather than trying to collect new sensations. 3. How do you feel about footnotes in books? In academic works, I think they’re fine as long as there’s more text than footnotes, and I prefer the footnotes to be on the same page rather than having to flip back and forth in the text. In fiction, I like them as long as they serve some humorous function (like Fforde’s “footnoterphone” or the footnotes in Jonathan Strange & Mr. Norrell). 4. Say someone offered to write you an awesome non-fiction book of your choosing. What would the topic be? I guess, if I could specify the author, I would love Brandon Sanderson to write a book about writing, encompassing both technique (world-building, writing good friendships and group dynamics into novels, etc) and the writing methods themselves (I’ve read an essay from him on that part and it was wonderful). If I couldn’t specify the author, I really have no idea what to ask for. I’m so picky about nonfiction! 5. Besides reading, what’s your favorite/most time-consuming hobby? Well, if you count writing as a hobby instead of as a potential career, that would be it. Otherwise, fitness? Blogging? 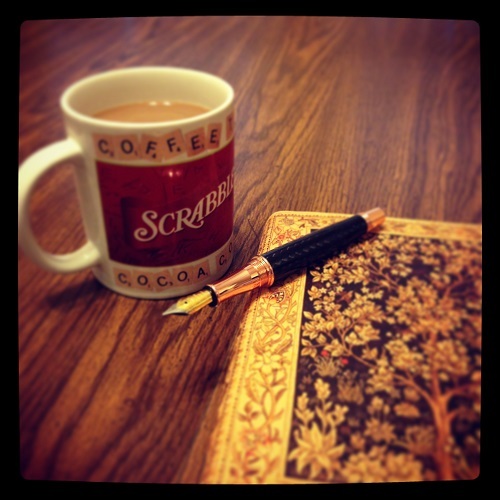 Journaling? I don’t really pick up a lot of hobbies to be honest. Coffee. Does coffee count as a hobby? 6. Which book was most uncomfortable for you to read? Did you finish it? Not sure I can answer this one. I’ve finished lots of uncomfortable books, and discarded lots of them, too (and wish I’d discarded some others). I guess it depends on the kind of discomfort. 7. Can you read in a language besides English? If not, which language would you pick? I can read passably in French, and the more I practice, the better I get. A few years back, I read the entire Harry Potter series in French, and it got easier with each book. I’d love to be able to read in it fluently. Definitely. I used to avoid most fantasy, especially more traditional fantasy. I also used to love memoirs, and mostly avoid them now. Biggest of all, there was a time in my life when I only enjoyed classics and disliked nearly all modern fiction. Those days are long gone. 9. Do you give or take more book recommendations? 10. In the vein of #8, have you ever changed your mind about a specific book? Definitely. There are some books that I think are brilliant on first read, and later can barely remember. Similarly, there are books that don’t make much of an impression in the beginning, only to stay in my mind for months and months, until they become favorites. I’m not sure I’ve ever gone from love to hate or vice versa, though. Just up or down from neutral. 11. Do you use your public library? Why or why not? I use my library ALL THE TIME. I don’t own a lot of books, or want to own a lot of books. I prefer the library. In that same vein, I really miss my San Antonio library. The one here is great, yes, but there are a lot of things that it doesn’t have. Plus, now that there’s ice all over the place, I can no longer walk there. Boo. Note: I think the point of these meme is for me to now come up with questions to tag others with, but…nah. 😀 It’s too early in the morning for my brain to be that coherent. 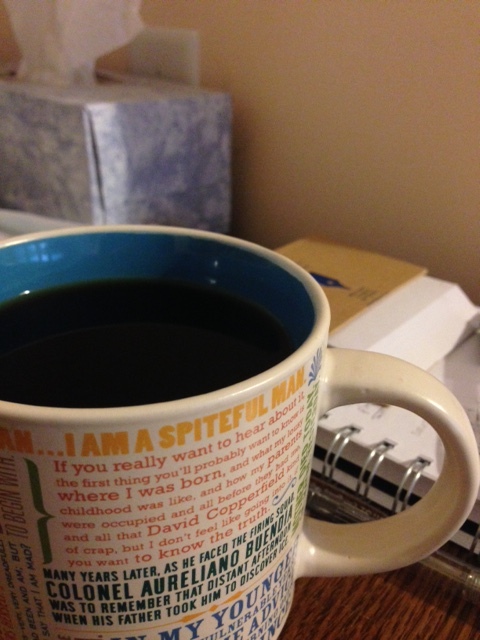 8 Responses to Sunday Coffee – Birthday! Happy birthday!!! Hope you have a really fantastic “me-day.” What are you painting? Fun or house? I don’t like book recommendations either–rather give them–but even worse is when someone brings you a copy of a book to borrow unsolicited. More times than not I keep it far too long feeling guilty over it and then return it unread. Sigh. I would love to learn to read in French! The courses I took in college are fading now, but Harry Potter might be a good way to pick it up again, since I know them so well in English. And I’m with you on all the ice! Ugh. I hate feeling like I have to skate to the library. Yeah I’m pretty sure my “reading” of Goodnight Moon was memorized but it’s still my strongest memory!